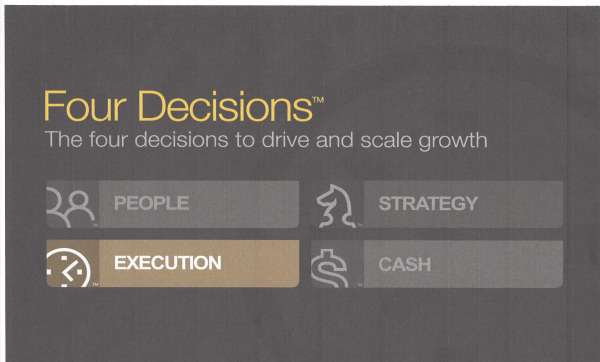 Execution is about turning your hard-earned revenue into bottom line net profit. this blog are Critical Number, Customer & Employee Feedback, and NPS score. Previous to this we reviewed Execution in Rockefeller Habits Checklist, Priorities, Metrics, Meeting Rhythms. We’ve explored all these in blogs before, thus you’ll notice hyperlinks to previous blogs to provide you with additional content on these tools. 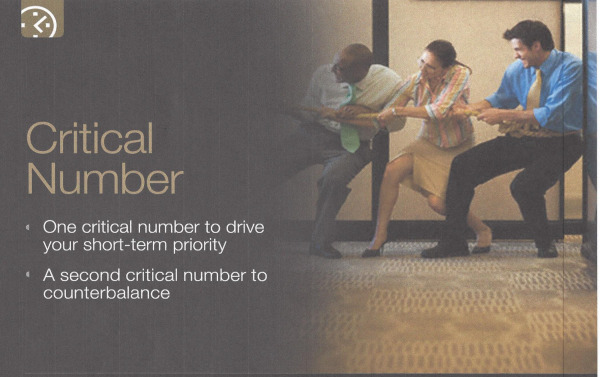 Critical Number: Of all the metrics we ask you to define, critical numbers are the most important. A critical number drives a short-term priority that you want your entire team/company to focus on and improve. Imagine if you could get the whole firm pulling behind a short-term priority. Just think about the progress you would make if everyone was working together to make one specific thing happen. How do you pick a critical number? Ask, what is our burning issue for this year/quarter? What do we need to improve most? What is our top priority for this year? There’s often a strong temptation to choose revenue as the critical number and we ask that you at least think more deeply about what specifically about revenue you would like to improve. Revenue can be improved so many different ways (increased number of new customers, increased pricing, increased frequency of buying), think upstream and try to decide specifically what you want more of and get your team focused on something more narrow that they can control. After you set a critical numbe, we suggest that you set a second critical number, which we call the counterbalancing critical number. Why? What if you had a tug of war with only one side pulling? You would get out of balance quickly. When you apply company resources to flex your muscles on one specific part of the company, you want to consider any negative implications on other parts of the company so you can counterbalance the effect. Customer & Employee Feedback: What qualitative customer and employee data do you regularly review and use to make better decisions? How often do you review it and how has it led to a better decision that made a significant impact on your business? This is a great start to using qualitative data! Let’s look at each of these two areas individually and see if they don’t stimulate one new idea for gathering qualitative information that can help you make better decisions. How many of you have regular conversations, not just exchanges, with customers to gather critical information? We recommend you have at least one conversation each week with a key customer. This conversation will allow you to get valuable feedback, build customer rapport, and get information you would otherwise not attain in any other way. How many customers should you be calling? IBM has its top 200 managers talk to 5 customers and employees every week and review the information every Friday. According to a blog post by a Gazelles International Certified Coach, a recent McGill Institute for Health and Social Policy study published by the Harvard Business Review reports that no matter what the size of your business –the way you treat employees at the lowest rungs of the company ladder can have a positive impact on your bottom line. Results demonstrated that in most businesses, front-line employees drive 90% of the profits. By increasing employee engagement you can cut staff turnover, find cost savings, increase productivity, and increase profits. Are you familiar with the 12 Elements of Engagement developed by the Gallup Group? Gallup has over 10 million sets of data on employees and companies that clearly show the impact of these elements on PERFORMANCE and PRODUCTIVITY. By regularly assessing employee evaluations of these 12 elements and gathering qualitative comments and feedback, you will have information to help you make better decisions that will lead to higher performance and productivity. Positioning Systems has used Gallup’s Q12 with our customers seeing dramatic growth in employee engagement. One reason for the growth is because the questions allow you to pinpoint specifically what a manager or company should focus on to improve. You should also talk to one employee a week. Take them to lunch and ask them if there is anything that they would like to share with you. What is the ONE main reason for your above answer? Costco, Harley Davidson, Apple and Nordstrom are a few examples of organizations that value NPS and what it can do to change, grow and improve their customer’s experiences. Think about these four companies and reflect upon the experiences you have had with them versus that of shopping or buying from their competitors. 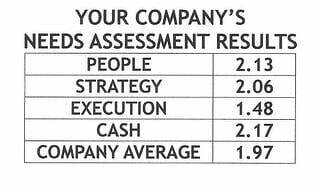 Net Promoter Score comes from Fred Reichheld’s books The Ultimate Question and Ultimate Question 2.0. Get a copy to learn more. We still have several Execution Growth Tools to explore. Up next blog are eNPS, Annual Planning, and Quarterly Planning.